On December 9, 1979, smallpox, the most deadly human virus, ceased to exist in nature. After eradication, it was confined to freezers located in just two places on earth: the Center for Disease Control in Atlanta and the Maximum Containment Laboratory in Siberia. But these final samples were not destroyed at that time, and now secret stockpiles of smallpox surely exist. For example, since the fall of the Soviet Union in 1991, and the subsequent end of its biological weapons program, a sizeable amount of the former Soviet Union's smallpox stockpile remains unaccounted for, leading to fears that the virus has fallen into the hands of nations or terrorist groups willing to use it as a weapon. Scarier yet, some may even be trying to develop a strain that is resistant to vaccines. This disturbing reality is the focus of this fascinating, terrifying, and important book. A longtime contributor to The New Yorker and author of the bestseller The Hot Zone, Preston is a skillful journalist whose work flows like a science fiction thriller. Based on extensive interviews with smallpox experts, health workers, and members of the U.S. intelligence community, The Demon in the Freezer details the history and behavior of the virus and how it was eventually isolated and eradicated by the heroic individuals of the World Health Organization. Preston also explains why a battle still rages between those who want to destroy all known stocks of the virus and those who want to keep some samples alive until a cure is found. This is a bitterly contentious point between scientists. Some worry that further testing will trigger a biological arms race, while others argue that more research is necessary since there are currently too few available doses of the vaccine to deal with a major outbreak. The anthrax scare of October, 2001, which Preston also writes about in this book, has served to reinforce the present dangers of biological warfare. The first major bioterror event in the United States-the anthrax attacks in October 2001-was a clarion call for scientists who work with &#8220;hot&#8221; agents to find ways of protecting civilian populations against biological weapons. In The Demon in the Freezer, his first nonfiction book since The Hot Zone, a #1 New York Times bestseller, Richard Preston takes us into the heart of Usamriid, the United States Army Medical Research Institute of Infectious Diseases at Fort Detrick, Maryland, once the headquarters of the U.S. biological weapons program and now the epicenter of national biodefense. Peter Jahrling, the top scientist at Usamriid, a wry virologist who cut his teeth on Ebola, one of the world&#8217;s most lethal emerging viruses, has ORCON security clearance that gives him access to top secret information on bioweapons. His most urgent priority is to develop a drug that will take on smallpox-and win. Eradicated from the planet in 1979 in one of the great triumphs of modern science, the smallpox virus now resides, officially, in only two high-security freezers-at the Centers for Disease Control in Atlanta and in Siberia, at a Russian virology institute called Vector. But the demon in the freezer has been set loose. It is almost certain that illegal stocks are in the possession of hostile states, including Iraq and North Korea. Jahrling is haunted by the thought that biologists in secret labs are using genetic engineering to create a new superpox virus, a smallpox resistant to all vaccines. Usamriid went into a state of Delta Alert on September 11 and activated its emergency response teams when the first anthrax letters were opened in New York and Washington, D.C. Preston reports, in unprecedented detail, on the government&#8217;s response to the attacks and takes us into the ongoing FBI investigation. His story is based on interviews with top-level FBI agents and with Dr. Steven Hatfill. Bioterrorism. Biowarfare. This book makes you want to crawl into a pressurized suit and stay there. Richard Preston opens eyes and spins heads in this excellent book. Don't be Afraid. It's Just Smallpox. What happens when the world is eradicated of a hugely destructive disease and scientists decided to keep some vials of it stored for research purposes? What happens when some of those scientists worked for the former Soviet Union and nobody really documented what happened to the vials after the breakup of said Soviet Union? What happens if this is real and not fiction? If you're not freaking out by now, then Richard Preston will do a much better job of getting you there. Like his previous non-fiction thrill ride "The Hot Zone," Preston delivers a horrifying look at what can happen when procedures and documentation go by the wayside and a deadly disease is possibly exposed to the masses. "The Demon in the Freezer" is a chilly story about the eradication of smallpox and how and why there are still samples of it existing in our world. You can't help but feel vulnerable after reading this book and and you can't help but wonder why in the world anybody needs to keep smallpox in storage. Very, Very, Very good! This was recommend in a Teacher Education Seminar that I attend this summer as the one to read for a good "Biology" summer reading. Everyone should take the time to check this one out. The story just grabs you and I couldn't put it down until finished. Great research and very informational. After it's read, you will realize, your just one good "sniff" away from turning into a "Blister". Few writers have the talent to parlay a non-fiction work about viruses into a mass-market paperback, but Richard Preston has done it twice. "The Demon in the Freezer" focuses on many scary aspects of smallpox, and delights in the details of our demise should we encounter our old foe. For us today, reading about the skin completely separating from the body due to a halo of pus is both repulsive and fascinating; but the world once had an everyday vocabulary for these symptoms. With little natural immunity left around the globe and the smallpox shot the most dangerous immunization you can take, "The Demon in the Freezer" points to a nasty vulnerability. Certainly a page turner and written in a style that is easily digested by the layman. I found it to be a bit "loose" in comparison to the Hot Zone. Towards the end of the book chapters on smallpox and anthrax are intertwined but leaves the reader with a great deal of dissatisfaction. The Demon in the Freezer starts and ends with anthrax, with smallpox in the middle. Though smallpox is generally thought to have been eradicated, Richard Preston examines the possibility that this cannot be certain and that we may see the virus emerge again, tieing in anthrax through theories of possible biological warfare. One of the main things I enjoy about Richard Preston's writing is that he does not simply list facts about the virus itself, he also tells the stories of the people involved, whether it be the victim or the scientist. The Demon in the Freezer is another true story written by Richard Preston that brings mystery, anxiety, and relief to its readers. The book begins in the 1970s with a glimpse at the life of an anthrax victim named Robert Stevens, and then moves to the life of a smallpox victim named Peter Los in Germany during 1969. These two stories are eventually linked together with the explanation of anthrax and smallpox, the histories of each, and the threat of bioterrorism. The Hot Zone and The Demon in the Freezer are very similar in format partly due to the fact that Richard Preston wrote both. This similarity detracts from the story line of The Demon in the Freezer if The Hot Zone has been read previously. It detracts from the excitement and mystery of The Demon in the Freezer, and diminishes surprise that comes from the climax, which is the anthrax scare. For instance, the beginning of The Demon in the Freezer begins with the lives of an anthrax victim named Robert Stevens and a smallpox victim named Peter Los, which draws the reader into the book as soon as they start reading it unless The Hot Zone has been read previously. The Hot Zone also starts off with a victim of a virus (anthrax isn't a virus but is still harmful to humanity) named Charles Monet. The virus that Charles Monet is eventually diagnosed with is the Ebola virus which is very deadly. The scene in which Charles Monet crashes and bleeds out, as the army calls it when blood comes out of every opening in the body of a victim of Ebola, adds suspense and gore to the beginning of the novel much more so than The Demon in the Freezer. The first few scenes in The Demon in the Freezer appear boring when compared to the first scene in The Hot Zone. The Hot Zone is also not as dry as The Demon in the Freezer overall: there is always suspense through The Hot Zone unlike in The Demon in the Freezer. When compared, The Hot Zone is a far better read than The Demon in the Freezer. The Demon in the Freezer, however, is still a great read. The novel provides insight into the production of bio-weapons and the reality of how dangerous they are when nations that have ill will towards others are producing them. The novel also stresses the importance of the eradication or almost eradication of small pox . For instance, when small pox was still a major natural virus, it killed approximately two million people a year, and the eradication of smallpox has saved around fifty-six million lives. The Demon in the Freezer is more of a historical novel than a historical thriller like that of The Hot Zone. Overall, The Demon in the Freezer was a great read despite its close similarity with The Hot Zone. "The way the world ends, not with a bang but a whimper." T. S. Eliot's bleak vision of the future doesn't even begin to include the gloomy prognostications revealed in this book. That terrorists will either acquire or develop biological weapons capable of destroying all human life is not just a possibility, it's a probability, as Preston makes abundantly clear in this update on biological weapons development. This book is the ultimate wake-up call. Even if you want to sleep after reading this, you may not be able to. Of the several biological weapons which have been under development in the past twenty-five years, smallpox is by far the most lethal and contagious, and irresponsible scientists have genetically engineered it in the past few years to make vaccination useless against it. Antidotes are unknown because humans are the only hosts for smallpox, and there is no way to run a test study of their efficacy. Preston points out, "It has taken the world twenty years to reach roughly fifty million cases of AIDS. [A single case of smallpox in an unprotected population] can reach that point in ten to twenty weeks." A massive research and development program for weapons grade smallpox and plague, along with the MIRV missiles and warheads to deliver them abroad, continued, unknown and unmonitored, in the Soviet Union for twenty years after smallpox was officially eradicated in 1978. The whereabouts of the twenty tons of "hot," genetically altered smallpox are currently unknown. According to a defecting Russian scientist, even the Soviet researchers do not know where it went, but "they think it went to North Korea." Iran and Iraq are also believed to have "benefited" from this research and to have ongoing, active bioweapons research programs. Thank goodness for the vaccination! Another book that will give you some serious nightmares. Really cool & interesting stuff on how smallpox was eradicated by a huge team of people all over the world. At some point it was thought that the only smallpox left in the world was at the CDC in Atlanta & at a Russian virology facility. Then came the 1980's & pretty good evidence that the Russians were conducting research on weaponizing smallpox. Meanwhile, US eradicated its supply of vaccine (to save money) - leaving us with about 1 vaccine for every 12,000 people. Then the Soviet Union fell apart & who knows where all those stores of weaponized smallpox went. Just yikes. While the emerging hemorrhagic fevers like Ebola are pretty freakin' scary, they (so far) aren't airborne - transmission is from skin and mucous membrane contact. Ebola also tends to burn through a population very quickly - killing off so many people around it that it runs out of places to jump. This makes it a less than optimal bioterrorism weapon. Smallpox, however, is unbelievably scary. It's airborne. During the 20th century it was responsible for between 300-500 million deaths. Transmission rates were it to re-emerge today are estimated to be at about an order of 10. That means 1 infected person would infect 10 others who would each infect 10 others, etc. Preston covers the debate among current scientists around whether or not to continue working with smallpox & testing it. Those against argue that it should all be destroyed. Those for argue that it can't all be destroyed and that with the ever present threat of bioterrorism on the rise, research should continue if only for the purpose of developing better vaccines. There are a number of nasty complications associated with the current vaccine which has been around since 1796. Preston also talks a bit about the anthrax letters, transmission, and early stages of the investigation into who sent them, but as the book was published in 2002, not much is known at the time he was writing. Nothing beats the Hot Zone. This is the 3rd book of what Richard Preston now refers to as his Dark Biology trilogy. He is undoubtedly one of the most informative writers on this topic, which certainly should be giving great cause for concern. I would strongly recommend the other 2 books : The Hot Zone is a non-fictional account about Ebola; the 2nd the Cobra Event is a novel, all the more effective for the background knowledge he had acquired. In this book Preston reverts back to the non-fiction genre to tell an upto date story about Anthrax (following the as yet unsolved incidents in the USA) and Smallpox (and the activities of the Russians in violation of International Treaty). There are other books available that had already discussed Anthrax or and/or Smallpox, so some of the material I already knew, but the section that was news to me, and thus more fascinating, was the description about the Smallpox outbreak at Meschede Hospital in Germany in 1970. If I have one criticism about Preston, it is that whilst he tries to show you the human side of what the participants were thinking at the time, he sometimes plays it to excess giving out superfluous information. This may be of use in a novel to create a sense of character, but in a non-fictional account, it isn't necessary. For example, instead of just saying he has lunch with one of his interviewees, you get the brand name of the beer that they drank (Molson). Elsewhere he describes meetings with others that they were drinking Glenmorangie & Linkwood Malt Whisky - at least he saved us from saying how old the Whisky was, or whether or not they had water with it. 'The Demon in the Freezer' is sort of a hodgepodge of nonfiction. Part of it concerns great detail on smallpox and its erradication, and another part delves into bio-terrorism (with the use of smallpox and anthrax). Surprisingly, the lesson on smallpox was very good (well-written and well-researched). Yet the bio-terrorism bit was disappointing. It felt as though the author was just glossing over the subject. At times he even pushed somewhat into the realm of editorializing on geo-political matters. Not a good move. If you like Richard Preston's books you will love!!!! Boat of Dreams that he wrote last year. He wrote it for a very special friend that was dying of breast cancer and made several copies for some of his other friends and it is an exellent book. This year it got published and was a big hit. If you buy this book you will not be dissapointed!! By now, with his third book about infectious agents (after THE HOT ZONE and THE COBRA EVENT), Richard Preston has firmly established himself as a virus nerd. His writing bursts with the thrill of discovering new outbreaks of disease and the tiny viruses responsible for epidemics. 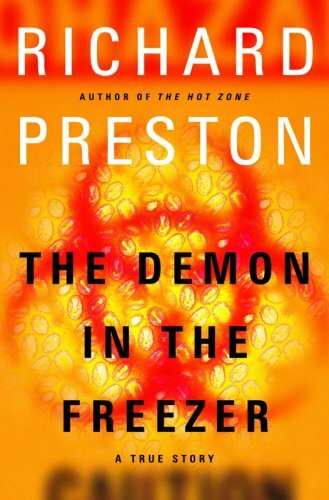 In THE DEMON IN THE FREEZER, Preston sets out to describe the horrors of the smallpox virus and its potential as a biological weapon. He charts the history of the disease, the progress of the eradication campaign begun in the 1960's, and the development of super-strains designed to kill large numbers of people. In an era without natural occurrences of smallpox, people have forgotten how horrific the disease truly is, and Preston makes sure his readers understand by graphically describing the progression of the disease from the first appearance of a centrifugal rash to the uncontrollable blistering, the collapse of the immune system, and, in some cases, the hemorraghic destruction of internal organs. The chapters on smallpox itself are framed by the anthrax attacks of October 2001. The possibility of biological warfare - by terrorists, a nation, or a disgruntled virologist - looms large in this book. At times, the book is repetitive, as though the author did not trust his readers to remember what he wrote earlier. The book also suffers from a loose construct - a skipping around from small pox to Ebola to anthrax as well as among the various principals in viral research - that seems to defy logic at times. Some of the anecdotes seem inserted merely to ratchet up the level of suspense. However, despite these flaws, THE DEMON IN THE FREEZER is a riveting narrative. Anyone who does not believe smallpox is a real threat should read this book. The insights into virology and genetic engineering are geared for the layman, making the text accessible to a wide audience. This book should scare the hell out of you. If everything had gone perfectly after the official eradication of smallpox in 1979, the last two stashes of the virus at the CDC and in Russia would have been destroyed long ago. However, scientific curiosity, threats of bioterrorism, and most importantly, the irresponsibility of the Russian political and scientific establishments have prevented the destruction of the deadly virus. Preston recounts the courageous and well-organized international smallpox eradication effort of the 60's and 70's in the first part of the book and introduces us to the characters who transformed the dream of ridding the planet of the horrible disease into a reality. The meat of the book, however, deals with one of the most pressing issues of our time, bioterrorism. Although the smallpox virus was to be kept only at the CDC and in a Russian institute after eradication, ample evidence exists that the Russians continued experimenting with the virus as a potential weapon and distributed it to several different research centers. If that's not scary enough, imagine the possibility of the virus getting into the wrong hands after the post-Communist degeneration of the Russian political and scientific establishments. Preston suggests that the virus quite possibly exists outside of the CDC and Russia bioterrorist research facilities, and it is potentially being reengineered into an even deadlier form. Any reasonably intelligent scientist with a small budget could easily experiment with the virus using techniques published in manuals available to everyone. The threat of bioterrorism is very real as the anthrax attacks of 2001 have shown us. Not only was the anthrax easily spread through the mail, but it was of professional grade. Preston describes the potential destruction the smallpox virus could wreak on all of us if bioterrorists figured out a way to deliver it surrepitiously. Smallpox is far deadlier than anthrax and very contagious. This book is downright frightening in its examination of the hubris of our world leaders. Having eradicated a deadly killer by unified action in the 1970's, the US and Soviet governments insisted upon keeping smallpox samples for scientific study. Today, much of what the Soviets had is unaccounted for and both governments clearly created weaponized virus strains that, if released among the population, would unleash an epidemic of Biblical proportions. Not everyone will want to read this book. I choose to ignore most news shows about nuclear or bio-terrorism so that I can sleep better. Others seek to improve their understanding the threats we all face. For those who are selective about the information they choose to absorb, this is a well-researched, well-told history of the effort to fight smallpox and bioterrorism. Preston tells the story of several individuals who have dedicated their lives in different ways to the fight against smallpox and bio-terrorism. Preston is very good at describing the incredibly dangerous missions that these people have chosen for themselves, and the diverse set of motives and beliefs that compel them. One example is the hippie who interprets a Pakistani mystic's garbled chant as a command to join the world-wide smallpox irradication effort. Another is the gripping story of a single woman just out of college who thinks the researchers who work in the "blue suits" are insane, only to find herself in a Level 4 unit working with Ebola and smallpox a few weeks later. The other aspect of the book that is as interesting in the way it is told, as it is frightening is the almost unlimited potential for bioterrorists to make even more virulent strains of these diseases. Today, everyone is aware of the threat of bioterrorism, but Preston succeeds in explaining just how dangerous the threat is. After telling a co-worker that I had enjoyed Preston's THE HOT ZONE she recommended this book as a follow-up. While I did enjoy it, I found the chapters about Anthrax boring in comparisson to the terror of smallpox and the fascinating story of its eradication.